The Rosary Vine (Ceropegia linearis woodii) is a most popular evergreen tuberous perennial indoor plant. It has long trailing stems growing to 1m or more. 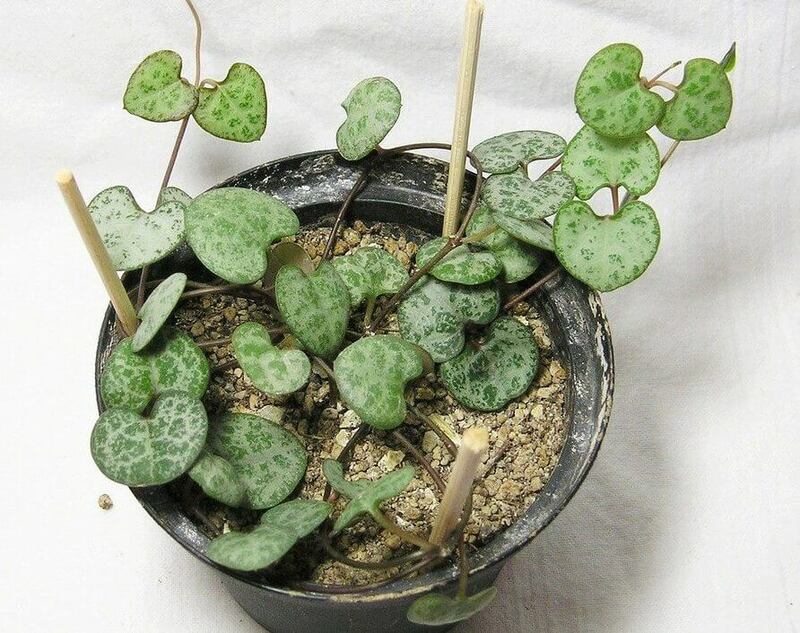 It bears pairs of small heart-shaped leaves. The leaves are splotched with a lacey pattern of white on the top and are purple underneath. The bloom is in general form similar to those of other Ceropegia species, waxy, narrow and bulbous at the base. The corolla grows to 3 cm in length and is a mixed coloring of off-white and pale magenta. The five petals are a deeper purple. Rosary Vine is perfect for hanging baskets, so the long trailing branches can hang down with their leaves spaced out like a row of large beads. 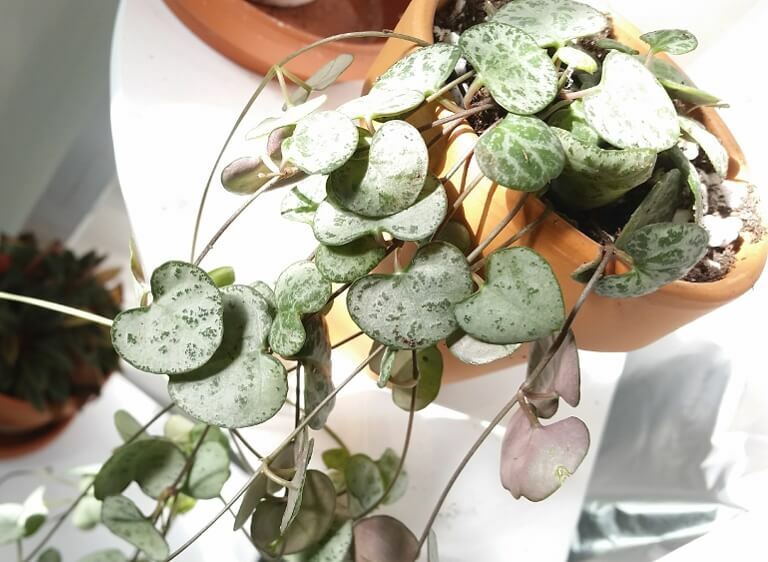 Common name: String of hearts, Chain of hearts, Collar of hearts, Rosary vine, Hearts-on-a-string and sweetheart vine. It thrives best in bright light with some direct sun for best color and plenty of leaves. It grows well in a rich, well-drained soil. Mix 1 part good-quality potting mix and 1 part sand or perlite. Water moderately, Keep the soil lightly moist in spring and summer. During fall and winter, water sparingly. Humidity is not an issue as they are dry land plants that can tolerate wide swings with no difficulty. It prefers normal room temperatures of 65°F – 75°F / 18°C – 24°C. Fertilize monthly in spring and summer with a balanced liquid fertilizer diluted by half. A string of hearts is easily propagated by stem cuttings. Take stem tip cuttings and insert cut ends in moist soil. Or cut off stem tubers and place them on the surface of the soil. Also can be propagated by seed at 19-24°C in early spring. Prune anytime the vining stems get out of hand. Re-pot in spring when it gets crowded, moving into a pot one size larger. This vining plant grows from 5 cm tubers. Place them on the surface of the soil. Use a sandy mix and a pot with a drainage hole to avoid soggy soil, which can cause the tubers to rot. Rosary vine has no serious pest or disease problems. Rosary vine is susceptible to attacks from mealybugs and aphids.